An Autumn Palette with Hidden Talent! The unique red stigmata on our Saffron Fall Blooming Crocus aren't just for looks—this is actually the seasoning agent saffron, considered the world's most expensive cooking spice! From saffron buns, to paella, to curry, saffron's delightful flavour is the key ingredient in some of the most mouth-watering dishes made around the world. 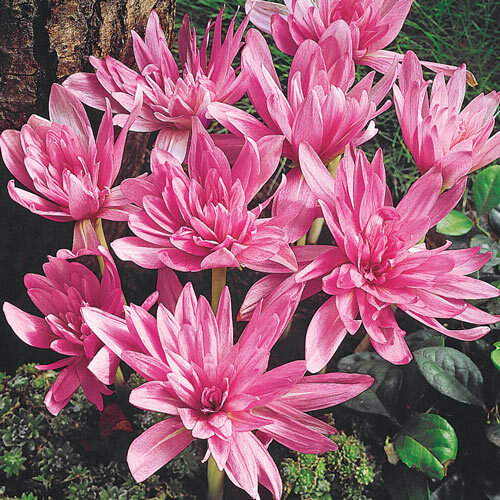 Our colchicum bulbs have an extra treat in store for your home—you'll get double the display with these unique beauties! Before planting them outside, simply place them in a windowsill, where they'll bloom without water or soil. After the colchicum have finished blooming, plant them outside. They'll provide spring foliage, and more dazzling flowers next fall. When most summer flowers have faded, and your neighbours are hanging up their gardening gloves for the winter, give your yard one more, extraspecial show! 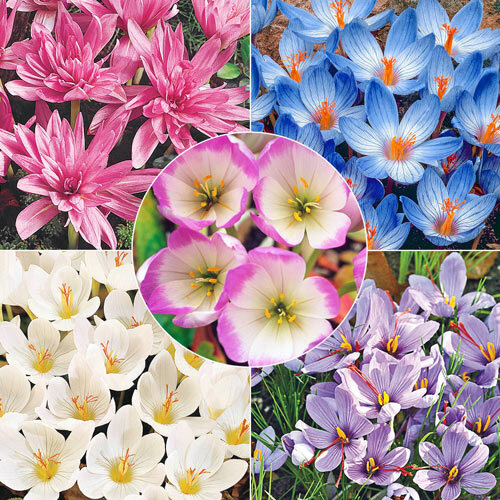 Just a few weeks after planting, these fall blooming colchicums and crocus will light up your garden beds in beloved colours and unique forms. 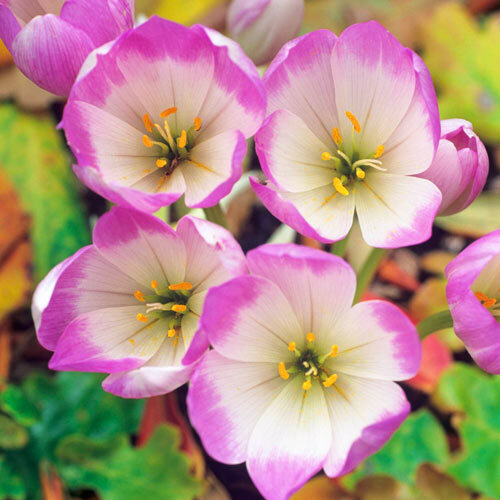 Year after year you'll be greeted by more colourful blooms, as your Autumn Jewels come back in larger patches. This selection of our favourite rare and exotic fall bulbs thrives in zones 4–9, in sun to part shade. 12 Conqueror Fall Crocus: Provides one last flash of brilliant colour before winter, with sky blue blooms veined in darker blue. A magnet for beneficial pollinators! Bulb Size: 5+ cm Height: 5–6". 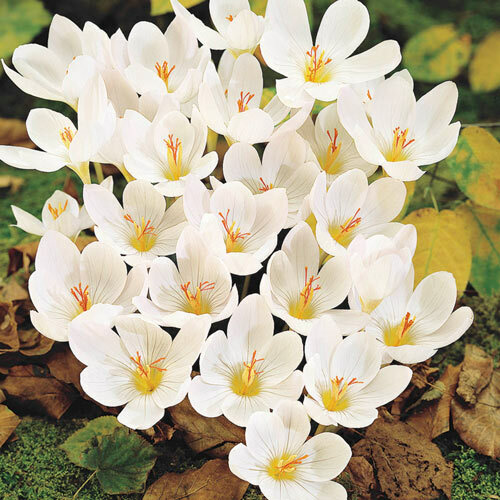 10 Fall White Crocus: With one of the most sought-after crocus colours there is, this expert naturalizer's pure white flowers glisten like pearls scattered through your garden beds. Bulb Size: 5+ cm Height: 6". 10 Saffron Fall Blooming Crocus: This easy-to- grow, yet stunningly unique ground cover features gorgeous lavender blooms highlighted by red stigmata. Bulb Size: 9-10 cm Height: 4–6". Flower Color Collection contains Double pink blooms, lavender-white, white, lavender with stripes and deep sky-blue. 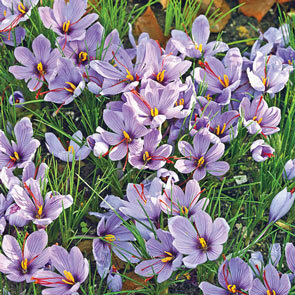 Foliage Type Fall Crocus produce small, grass-like foliage in spring. 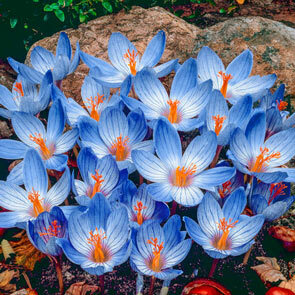 Colchicums have larger foliage in spring.